Porcelain dental crowns are a cosmetic dentistry treatment that restores and strengthens your teeth. 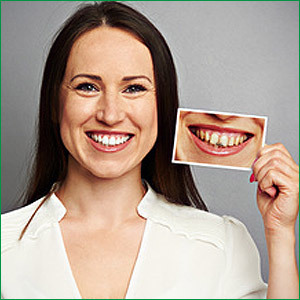 Santa Monica cosmetic dentist Dr. Brightleaf treats each smile as a work of art and can customize your dental crowns to meet your needs, giving you a dazzling smile. Porcelain crowns are caps for your teeth made from durable, natural looking porcelain. They are bonded directly to your natural teeth to provide aesthetically appealing function for your smile. Placing your dental crowns is a two-step process. During the first visit, Dr. Brightleaf will take a mold of your teeth to use for the custom creation of your permanent crown. She will fit you with a temporary crown until your next visit. On the second visit, your custom made porcelain crown will be permanently adhered to your natural teeth. Porcelain crowns provide natural looking solution for your dental problems. Unlike traditional crowns, they will not leave a dark line around your gums. Your porcelain crowns will look and feel like part of your natural smile, only better. To learn more about how porcelain crowns can restore your smile, please call 310-734-2511 or contact Brightleaf Dental to schedule your consultation with Santa Monica cosmetic dentist Dr. Ana Brightleaf.